Wednesday November 20th 1895 The boys did not husk today. Will went down town in his waggon after dinner. I finished my aprons and did some other sewing. I knit all the evening. It was eleven years today since Charlie & Ida were married. 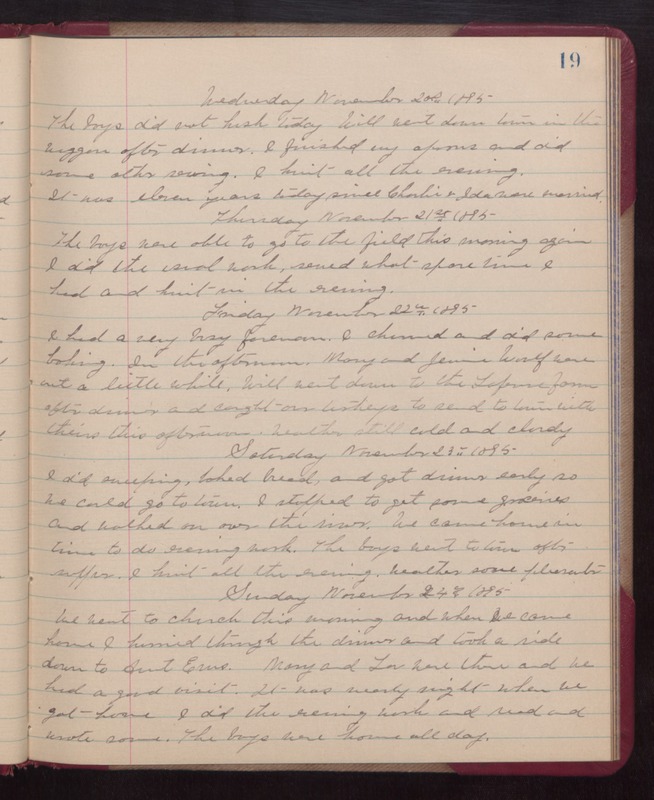 Thursday November 21st 1895 The boys were able to go to the field this morning again. I did the usual work, sewed what spare time I had and knit in the evening. Friday November 22nd 1895 I had a very busy forenoon. I churned and did some baking. In the afternoon Mary and Jennie Woolf were out a little while. Will went down to the [Lapure?] farm after dinner and caught our turkeys to send to town with theirs this afternoon. weather still cold and cloudy. Saturday November 23rd 1895. I did sweeping, baked bread, and got dinner early so we could go to town. I stopped to get some groceries and walked on over the river. We came home in time to do evening work. The boys went to town after supper. I knit all the evening. weather some pleasanter. Sunday November 24th 1895. We went to church this morning and when we came home I hurried through the dinner and took a ride down to Aunt Ems. Mary and Lee were there and we had a good visit. It was nealy night when we got home. I did the evening work and read and wrote some. The boys were home all day.